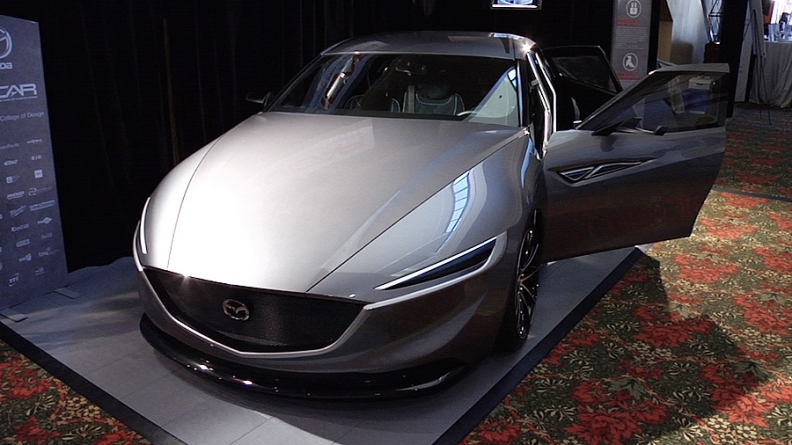 Students from Clemson University's automotive engineering school were tasked a couple of years ago with designing a bona fide Mazda concept car. TRAVERSE CITY, Mich. -- Think the auto industry pros have America's massive rising Gen Y youth market all figured out? Sometimes it becomes painful apparent that you don't know what you don't know. A band of grad students from Clemson University's automotive engineering school were tasked a couple of years ago with designing a bona fide Mazda concept car that they have just delivered. What they unearthed along the way may be a little uncomfortable for automakers for the next few years. The Clemson students spent two years asking the question, what do young car buyers really want? No -- what do they really want? The answer they got back is a car segment that doesn't exist yet. And worse, it isn't even clear yet how engineers might make it exist. The Gen Y crowd wants a car that is sporty on the outside, but roomy on the inside, the team says. But more specifically, they want to be able to drive around with their friends -- many friends -- all together in the same car, like a big social event. A five-seater isn't good enough. And a seven-seater tends to translate to a frumpy minivan -- which they expressly don't want -- or a crossover/SUV, which they also don't want. They simply want a small car that can carry six people comfortably. The Clemson group responded to this by creating a 3 + 3, a traditional two-row sedan, but with three seats in the front. An old-school front bench seat wouldn't work, they knew, because it wouldn't allow for air bag safety for the passenger in the center. So their Mazda concept features a third front bucket added between the driver and the right-hand passenger seat. This solution also isn't perfect, they admit. Side-impact regulators might blanche at the idea of a center passenger moving sideways into his neighbor without a side airbag. But the problem has at least been laid on the table now. Discovery No. 2 might also give industry planners some discomfort. According to the Clemson research, young and not-so-wealthy Gen Y consumers don't really like entry-level cars. They don't want bottom-of the-line. They want a more expensive car. But they can't necessarily afford it. "This young generation is really a difficult market," says Paul Venhovens, the Clemson professor and former BMW executive who supervised the student project. "They don't really gravitate to econo-boxes. They seem to want what they can't afford." Consider that a challenge from one generation of auto engineers to the next.